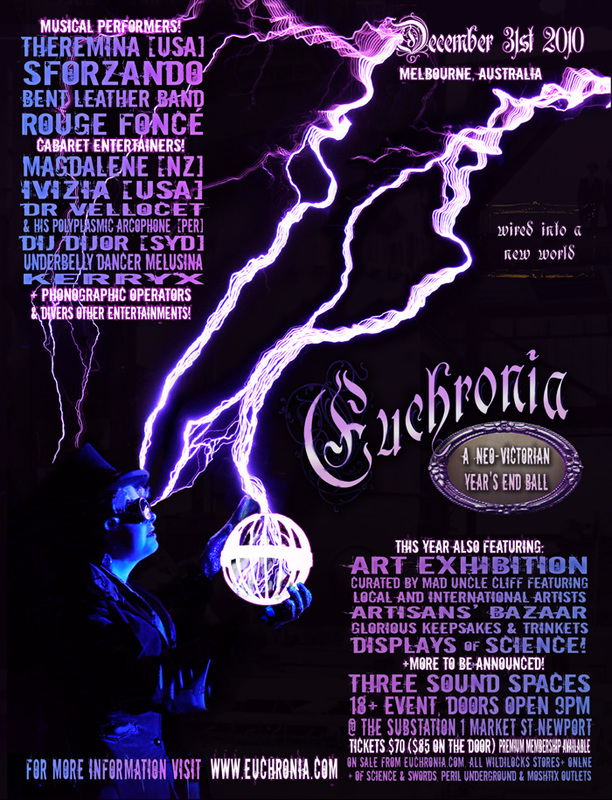 It is with very great pleasure that we can finally announce a major update to the Euchronia bill, and reveal our new poster (click for large version) - which has a fantastic story of its own involving death-defying feats with Tesla Coils c/o the very talented Peter Terren of Tesla Down Under! But that's a longer story, and deserves an entire post of its own — which we shall bring you very soon, but not today. Today is dedicated to our exciting new international and interstate attractions! Firstly, we would like to introduce the very lovely Melusina, a star dancer and teacher with Underbelly, Victoria's premiere Bellydance school and highly recommended by one of our star acts from 2008, Ma'isah of Raqs Gothique. Read more about Melusina here. 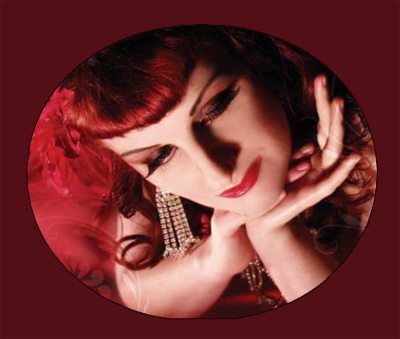 Next, another international artist from across the ditch - Magdalene has performed in fetish clubs in London and NZ and has more recently been making a splash in the NZ burlesque scene. She uses her background in Arabic Dance to create unusual, sometimes beautiful, sometimes horrifying scenes to draw her audience into the emotional landscapes of her performance. More about Madalene here. Secondly, we are very excited to add to our bill a stunning lass from California, USA - the very talented Ivizia who specialises in awesome fire performance. Read more about Ivizia here. Fresh from The Steampunk Symposium as part of the Under the Blue Moon festival in Sydney earlier this year, Gentleman Adventurer, Stewart Rule & steampunk maker, Sir Dij Dijor brings to Euchronia a selection of his finest contraptions and inventions for your wonderment and awe. 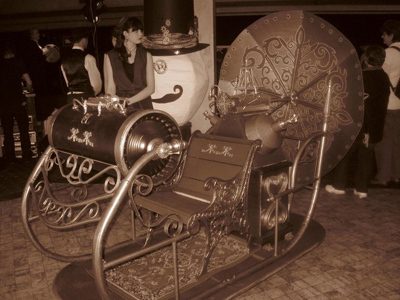 Delight in witnessing the awesome Time Machine! Thrill to the power of the Proto Plasmic Wave Blaster! Joining us from the wilds of Western Australia is the very dapper Dr Vellocet and his Polyplasmic Arcophone (Featuring "Electra"). The arcophone is a feat of science, melding electrical energy with sound! Read and see more about the Arcophone at The Artifactory website here. "SFORZANDO follow the three ancient rules of piracy. Rule 1: Respect the music of the ocean. SFORZANDO intend to steal steampunks to work on their pirate ship 'The Evil Betty'. You have been warned." For more about any of the acts in the lineup, including DJs and everything else on offer (and there's more to come!) 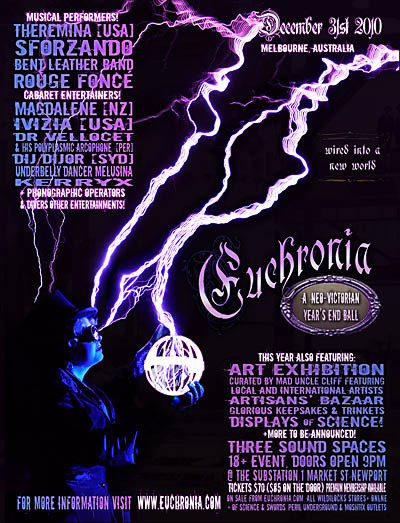 please head to the Acts & Attractions page on euchronia.com. 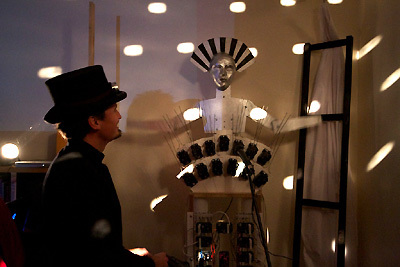 Tana Karo will, unfortunately, not be performing at Euchronia. We have spaces for several stalls at the bazaar, if you are interested in selling your wares, please check out the Bazaar page for more information and an application form. Have some steamy Object's D'Art you'd like to exhibit at Euchronia? Contact Antipodean Maker extraordinaire Mad Uncle Cliff with your details on ! Excited yet? Do you have your tickets yet? Tickets are still available at the pre-release price of $55 when purchased with an ALTV membership, available only from euchronia.com or Wildilocks. Please read more on the Tickets page. We're also happy to offer discounted tickets for groups of 10 or more booking together; please email for more information. Stuck for ideas on what to wear? We've updated our What to Wear page too, and welcome suggestions for more. Look out for more from us very shortly. Huzzah!